As it edges close towards Christmas, the blogosphere is simply buzzing with ideas popping, from simple to simply elegant. The world is bursting with creativity.. from simple to elaborate.. from food to decorations...and everything in between. But, the common vein in it all is the love that goes into each creation making it special. Well, I am not one to break tradition. So, today I share with you a dish that is served on special occasions in my country, Mutton Biriyani. 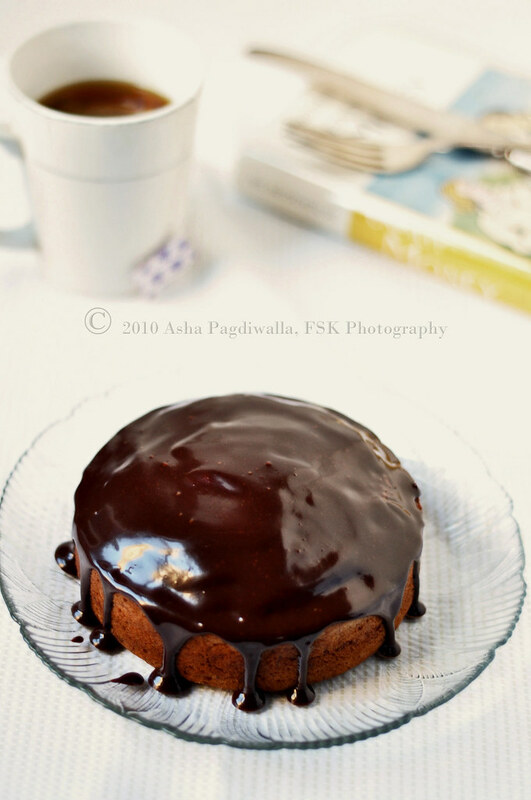 A dish that takes some labor and quite a bit of love that you taste every bit of! 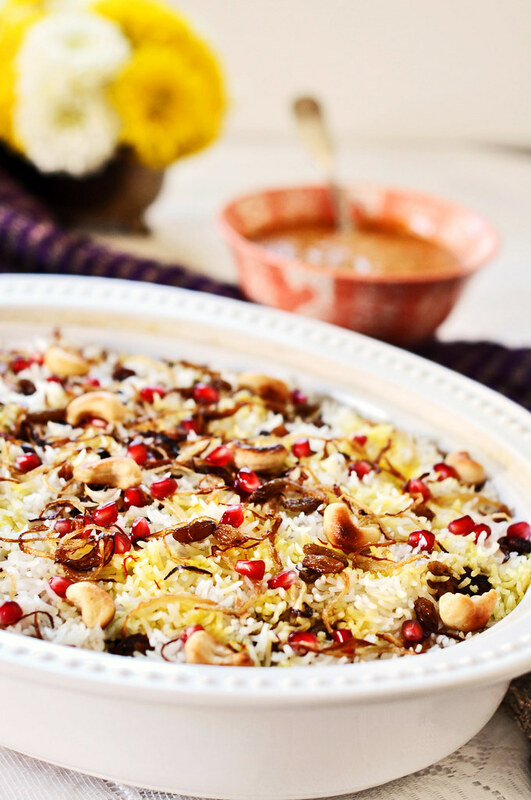 Biriyani originated in Persia and was brought to India by travelling Iranian merchants. It is a flavored rice dish made with alternating layers of rice and meat. The meat is cooked separately in a thick sauce/curry and then arranged between layers of rice and the whole assembly is then cooked very slowly to infuse flavors throughout the dish. Spices have always been precious and festivals are occasions to indulge and splurge. Accordingly, food on these special days is enhanced in flavor, aroma and richness by various spices and ingredients indigenous to the country like cinnamon, cloves, cardamom and Basmati rice and those introduced through the ancient spice routes such as saffron, dried fruits and nuts. 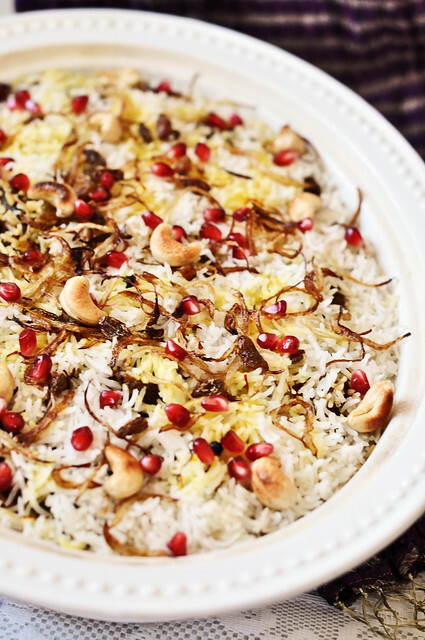 Although, every family makes its own version, the Iranian Dam Biriyani (dam: steamed) is the most flavorful of all. 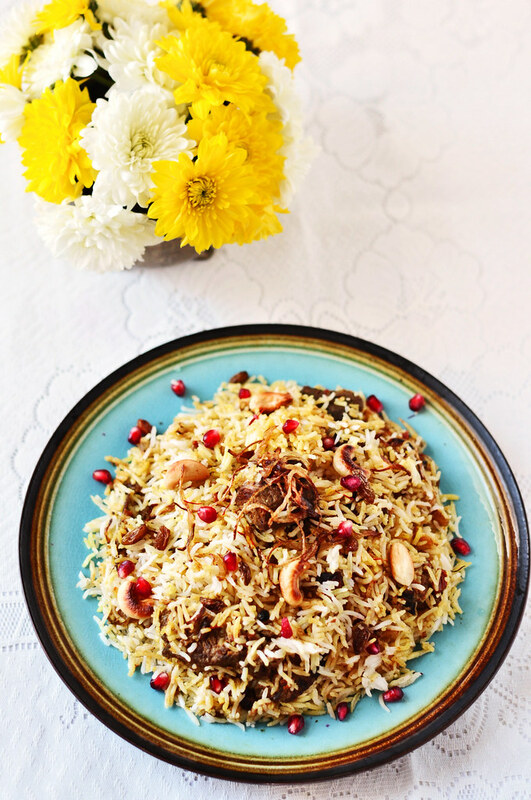 I share with you today my family's recipe for the traditional Mutton Biriyani. As would be expected, given our Persian origins, this is indeed an adaptation of the original dish. 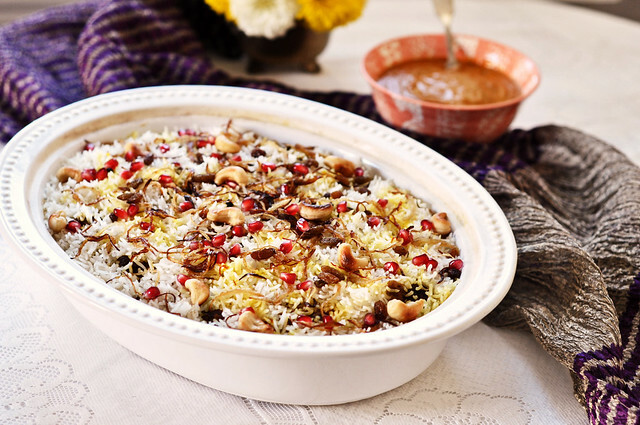 Biriyani is an informal meal, typically eaten family style with the whole family gathered around a giant plate piled high with flavored rice and flavorful meat. That's a fantastic way to eat it, everyone digging in, laughing and enjoying the meal. 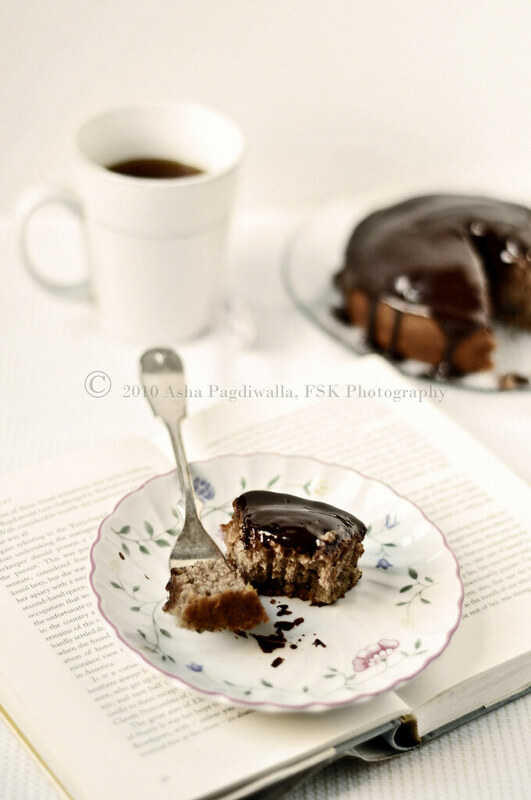 But, I also wanted to share a way that the dish can be plated elegantly for a formal occasion. For more fabulous Christmas meal ideas check out the latest issue of G2Kitchen. 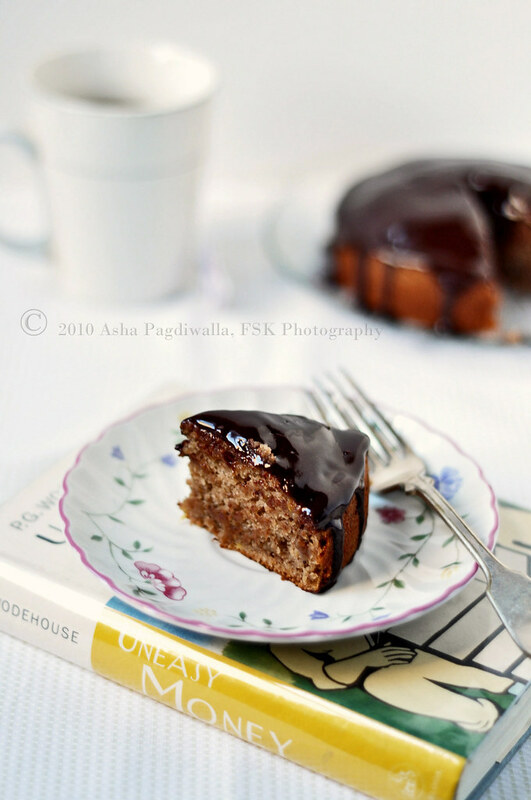 You'll also find my recipes for the Goan Pork Vindaloo and Christmas Fruit Cake in there. If you are craving more ethnic, you'll find more Indian recipes here. Mix together the marinade ingredients and coat the mutton with it and let it sit in the fridge for at least 4 hours, best overnight. In a heavy bottomed pan, roast the whole spices in ghee until the aromas are released. Add the onion and sauté until translucent. Add the ground spices and sauté for a couple of minutes. Add the meat and toss until browned. Now, add the tomato and pumpkin and cook for a few minutes. Add water. At this point you can transfer the mixture to a pressure cooker and let it cook for six to seven whistles or cook on a low flame until the meat is really tender. Let the cooked curry rest for a few hours to allow the flavors to blend. Meanwhile make the rice for the Biriyani. In an deep, heavy bottomed dish, sauté the whole spices in ghee over low heat until they release their aromas. Add the rice and toss for a couple of minutes. Add salt and water and mix well. Cover the dish and cook on medium heat until the rice is cooked, about 20 minutes. In a large deep baking dish, spread a thin layer of the just the curry without any meat. This is to ensure that the rice doesn’t stick to the bottom. Arrange an even layer of rice over it. Pour a third of the saffron milk evenly over this layer. Pick out the mutton pieces from the curry and spread over the rice. Sprinkle a thin layer of the curry to cover the rice. Repeat to make another rice and meat layer using up all the mutton pieces. Top off with a thin rice layer. Pour the remaining saffron milk over this. Sprinkle the garnish evenly on top. Puree the remaining curry to make the Salan to be served on the side. Bake covered in a preheated oven at 350 F (180 C) for 30 - 45 minutes to allow the rice to pick up flavor of the curry and spices. You can serve in the same dish or heaped onto a large platter. When serving, make sure to reach to all the layers. Biriyani is typically served with the salan on the side and a yogurt raita. Mix all the ingredients together. Toss the chops in the marinade and let rest for 4 hours. When ready, melt butter in a frying pan. Sauté the chops for 2 minutes on each side and transfer to an oven at 350 F (180 C) for 10 minutes. 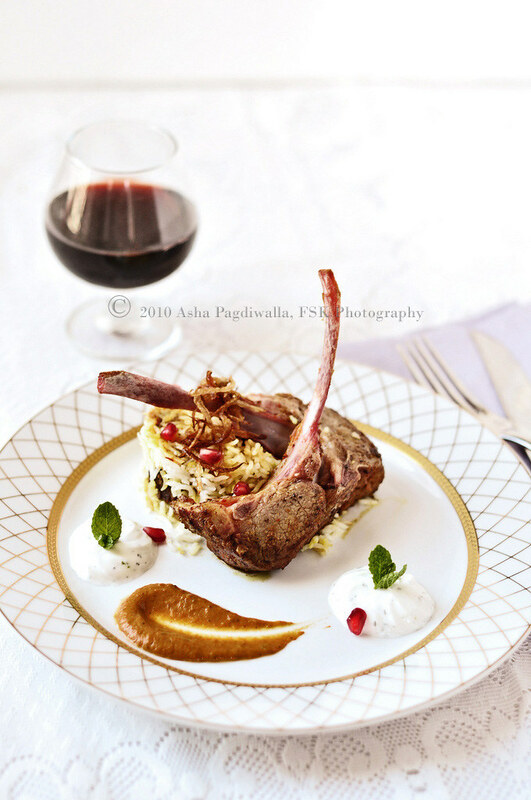 Serve with helping of mutton biriyani with drizzled with salan and lime-mint yogurt on the side. It's that time of the year again.. when houses, in India, are lit up with gorgeous little oil lamps and people, young and old, dress up in fine, new clothes, a radiant smile and exchange a ton of homemade goodies and simply enjoy each others' company. It's Diwali, the Indian festival of Lights!! It's the symbol of light entering our lives and the triumph of good over evil. I remember as a kid, this was a much looked forward to time of the year. I got new clothes, a lot of yummy goodies, those my mom made as also those from friends and family. And, then there were the crackers! Being the festival of lights every family literally lights up the sky with gorgeous flares that in every passing year increase in complexity and beauty! The ritual of the crackers begins many days, even weeks, before the day of Diwali. First, you scout all available choices and exchange notes with friends and classmates. Then, you wheedle your parents into buying that fancy package or yet another of that! Once the merchandise comes home, mothers take over the care. The crackers need to be stored in a moisture free area, else the gunpowder will just fizzle. So, there are hours and days of sun drying. Of course, most of this comes to naught as it inevitably rains on the day of Diwali. And, I have empirical evidence of that particular weather pattern being agnostic of geography! The festivities, begin atleast the day before (in my childhood, perhaps earlier now), with some enthusiastic kids testing their goods, building into a crescendo on the day of. As a kid/child, you wake up in the morning, clean up, wear new clothes and then start bursting crackers... from long chains of small ammo to the deafeningly loud "hydrogen bombs". It's interspersed with the eating and merry making but the crackers are the real focal point. As the dusk falls, the loud is gradually replaced with elegant as the night crackers take over the skies and the grounds. From gorgeous fountains, bursting rockets and a multitude other creations limited only by physics, the sky lights up into an Aurora Borealis!! Mix all cake ingredients and pour the batter into a five inch cake pan. Bake at 350F for 25-30 minutes until cake is done. Cool in pan for five minutes, then remove the cake and cool on rack. Meanwhile, make the ganache by microwaving the chocolate in milk for 30 seconds. Stir to get a shiny, smooth mixture. Set aside to cool. 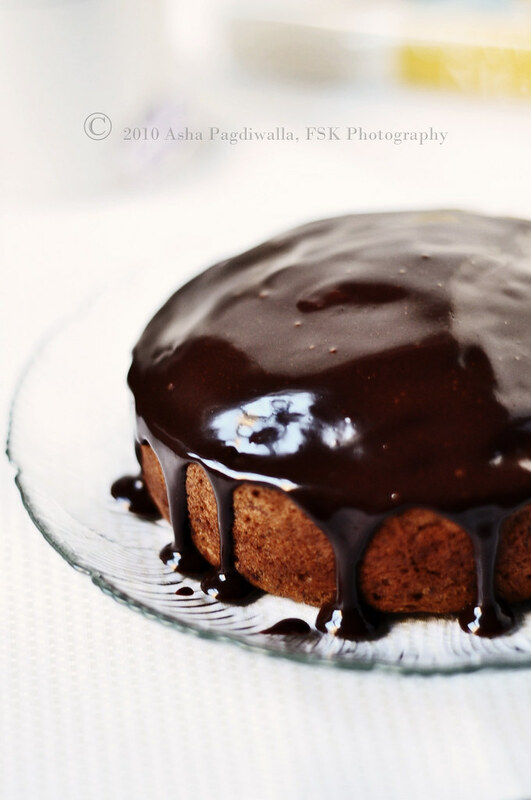 Spread the ganache in a thick layer once the cake has cooled down completely.